People who own or have control of property have a responsibility to properly maintain it. Failing to maintain property can result in slip-and-falls and other accidents that cause serious and even fatal injuries. Many of these injuries will leave victims unable to work or care for their families and may even leave permanent scars or disabilities. If you or a loved one has been injured on the property of another, a seasoned premises liability attorney can help you recover maximum compensation for your injuries. 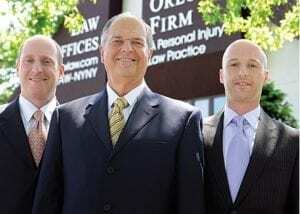 The Orlow Firm is a law firm with more than 30 years of experience representing victims of personal injuries, including slip-and-falls and other premises-related accidents. We help clients in Brooklyn, Queens, Bronx and Manhattan and throughout New York. Our attorneys offer free consultations for potential premises liability cases after slip-and-fall accidents or other accidents resulting from negligent maintenance. Call (646) 647-3398 or email us. Premises liability claims can result from many other types of accidents and injuries. If you were attacked while at your rental property, you may be entitled to recover for negligently maintained locks, faulty fire exits and other failed maintenance. Our attorneys have experience representing victims of rapes and assaults resulting from failed maintenance or security. A $2.875 million settlement for a 56-year-old man who fell 16 feet into an open elevator shaft at his apartment building. He suffered a fractured vertebra in his back as well as broken bones in his heels. A $500,000 recovery for a 28-year-old nurse who injured her knee at work when she slipped on water from a leak the hospital had failed to repair. The following articles provide more information about premises liability. Premises Liability: Can You Prove It? Dangerous Dogs: Does the Landlord Pay for Damages? Employers and building owners have a responsibility to provide a safe place for workers to do their jobs. Despite this, workers in New York City are regularly injured by unsafe conditions at offices and other work sites. Workers may look first to workers’ compensation, but it may not cover the full cost of their injuries. In some cases, workers who are injured by dangerous conditions at work may have premises liability claims. The Orlow Firm can help. We are a NYC law firm that focuses on helping injured people obtain the compensation they need to recover. We believe our clients deserve the best representation possible, and we make sure that they speak directly with a partner at the firm. We serve clients throughout New York City, including Queens, Brooklyn, Manhattan and The Bronx. Cleaning hazards. Maintenance companies that wash floors and clean offices may create dangerous situations for workers in the building. Slip-and-fall accidents can result in serious head injuries, spinal cord injuries and broken bones. Elevator accidents. Elevator accidents can happen when machinery is defective or when elevators are not maintained or inspected properly. Equipment hazards. Cleaning and construction equipment can create hazards if they are not safely stored and used. Poorly maintained buildings. Buildings that are not kept up may develop safety issues such as broken stairs, uneven sidewalks, inadequate fire protection and other serious dangers. Workers who are injured due to one of these hazards may have a premises liability claim. Although employers often cannot be sued directly, workers may be able to file third-party claims against other negligent parties, including cleaning companies, property owners, construction firms, elevator maintenance companies and others. Successful third-party claims may result in more compensation than workers’ compensation alone. Under workers’ compensation laws, construction workers can receive benefits to cover lost wages and medical expenses when they are injured in a work-related accident. Unfortunately, these benefits may not cover the total cost of injuries. In some situations, workers can obtain additional compensation from property owners who cause or contribute to an accident. Claims of property owner liability can be complex and hard to identify. Often, an injured worker may not realize that a property owner or other third party can be held accountable. At The Orlow Firm, our lawyers understand the circumstances in which third-party claims arise against property owners, and we have the experience and dedication that our clients need. We serve injured victims throughout New York City. Property owners have a duty to make sure their land and buildings are safe for construction workers. New York’s construction safety laws provide strong protections for workers. When property owners fail to provide a safe environment for construction workers, they may be held liable in a third-party claim just like contractors and subcontractors. The law regarding third-party claims provides significant protections for workers, but it is complex. Property owner liability will depend on the law and the circumstances of the case. The Orlow Firm has more than 30 years of experience helping injured people recover the compensation they need after accidents. We understand New York’s labor laws and how they can benefit injured workers. If you have suffered an injury on the premises of another, we would be happy to provide you with an assessment of your injuries and an explanation of the extent of damages you may be entitled to recover. Contact us online or call (646) 647-3398 to schedule a confidential and honest assessment of your case.